CytoSport, Inc., the parent company to the Muscle Milk® brand, has teamed up with Hope For The Warriors® to launch a limited edition, ready-to-drink bottle to honor those who have served our country through military service. ytoSport, Inc. will donate a portion of sales from each bottle to Hope For The Warriors®, a national nonprofit dedicated to restoring a sense of self, restoring the family unit and restoring hope for our service members and our military families. The limited edition bottles are available on military bases around the country and will hit shelves on American military bases overseas later this month. The shakes are available in 14 ounce bottles in chocolate flavor and contain 25 grams of protein to help aid muscle recovery. 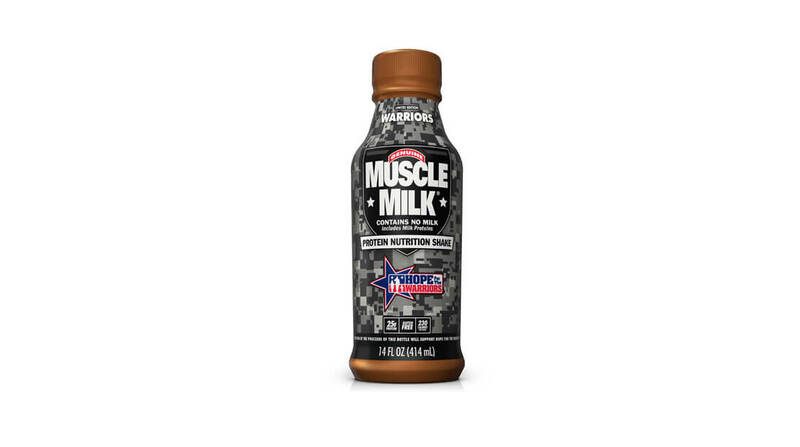 As part of the partnership, the Muscle Milk® brand will provide products at the finish line for select Hope For The Warriors® races and sporting events. CytoSport, Inc. employees also compiled and donated 500 recovery packs with workout gear, shaker bottles and powder packets to provide to veterans training through Hope For The Warriors® programs. We believe those touched by military service can succeed at home by restoring their sense of self, family, and hope. Nationally, Hope For The Warriors® provides comprehensive support programs for service members, veterans, and military families that are focused on transition, health and wellness, peer engagement, and connections to community resources. Hope For The Warriors® has earned a Four-Star Rating from Charity Navigator (www.charitynavigator.org) for four consecutive years. Charity Navigator is an independent organization that evaluates fiscal responsibility and accountability of nonprofits.